Pagi ini saya bersama rekan-rekan siswa mancanegara melaksanakan tes HSK-2, atau semacam “TOEFL” untuk Bahasa Mandarin sebagai salah satu syarat melanjutkan program S-2 di China. الْحَمْدُ لِلَّهِ رَبِّ الْعَالَمِينَ tes berjalan dengan aman dan lancar, tinggal menunggu hasilnya bulan depan, semoga sesuai dengan harapan. Siang hari saya mengantar istri ke KBRI Beijing untuk menunaikan salah satu haknya sebagai warga negara, yaitu melaksanakan pemilihan serentak yang terdiri dari pemilihan Presiden RI dan pemilihan anggota DPR RI. Suatu hak yang juga sebetulnya diberikan kepada saya, namun sebagai anggota TNI sesuai UU dan aturan lainnya, saya menggunakan hak pilih saya untuk tidak memilih alias “NETRAL”. Sebagai anggota TNI tentunya mewajibkan saya untuk tidak ikut campur dalam hal apapun yang berkaitan dengan pesta demokrasi ini. Satu hal yang bisa dilakukan hanyalah ikut mengamankan jalannya pemilu ini agar berlangsung dengan aman, jujur, bebas dan rahasia. Namun sebagai seorang praktisi militer dan seorang akademisi, tidak ada salahnya untuk ikut menyimak proses kompetisi pilpres yang menurut saya cukup menakjubkan ini. Masing-masing paslon dengan tim suksesnya melakukan berbagai strategi untuk kemenangan pihaknya, baik melalui press conference, media sosial hingga ceramah dan cara lain yang tentunya bertujuan untuk meningkatkan elektabilitas. Hari ini rakyat Indonesia melaksanakan pesta demokrasi dalam negeri. Yup, hari ini pilpress dan pileg dilaksanakan secara serentak di seluruh wilayah Indonesia dengan segala masalah, hambatan, rintangan serta kejadian lucu lainnya yang kerap timbul setiap kali kita melaksanakan pesta demokrasi, mulai dari “serangan fajar”, intimidasi, surat suara yang sudah tercoblos, sampai dengan pihak-pihak yang harusnya netral seperti KPU, Bawaslu dan pihak lain, tapi dengan jelas mendukung pihak tertentu. Pesta telah usai, apapun nanti hasilnya, itu adalah suara Rakyat Indonesia. Marilah kita kembali bersatu, bahu-membahu membangun negeri tercinta kita dengan segenap tenaga yang kita punya. Ketetapan Allah SWT itu nyata dan sudah tertulis di Lauful Mahfuz apapun hasilnya. Tinggal kita mau menerima atau tidak, dan pastinya apa yang terjadi dalam kehidupan ini adalah karena suatu alasan, apapun itu. Terima kasih rekan, sahabat dan semua yang berpartisipasi dalam pesta demokrasi ini, terima kasih telah menjaga ketertiban dan keamanan selama prosesnya. Mari kita tunggu hasilnya bersama, yang menang jangan jumawa, yang kalah tetap berdiri tegak bersama. Nobody can describe about the ancient history of military strategy perfectly. But in China, “The Art of War”, as a book on ancient Chinese military theory has came out more than 2500 years ago, introduced by Sun Tzu who lived approximately from 550 BC to 480 BC. His book covers a rich content with brilliant ideas of military strategy which spread and influenced in world history. In modern-old periode, after the collapse of the imperial dynasti, China also have few men who has great military thinking along with the formation of the Red Army who fought alongside the Chinese people in seizing independence in the year of 1949 against Guomindang Party with its counter-revolution armed forces. One of the greatest leader of People Liberation Army is Mao Zedong (Chairman Mao) who have many thinking of the military strategy which have been applied in many battle during civil war. As we know, there were significant differences between Red Army and the Guomindang troops, both in terms of number of personnel, weapon, ammunition and equipment. He applied basic viewpoints of dialectical and historical materialism to military matters, analysed the relation between people and weapon. “He said that weapons are important factor in war, but not decisive factor. It’s people, not things, that are decisive. The contest of strength is not only a contest of military and economic power, but also a contest of human power and morale. Military and economic power is necessary wielded by people”. This military thinking has been proven in various wars. One of the famous battle which was refers to this thinking is the general attack on the city of Yogyakarta that occured on March 1st, 1949 between the Indonesian National Army and the Netherland Forces which can raised the bargaining position of the Republic of Indonesia in the International Commitee. After the independence of the Republic of Indonesia which has proclaimed by Soekarno and Moh. Hatta on August 17th, 1945, the Netherland Goverment was still tried to took over the legal goverment of the Republic of Indonesia to became one of the commonwealth countries of the Netherland based on their own perception. According to this perception, the Netherland decided to directly attack the Republic of Indonesia in order to acces commodities in Republican-held areas, in particular sugar, oil and rubber as they had for more than 350 years before the independence of the Republic of Indonesia. The first military aggression was held in July 21, 1947 by deployed three divisions in Java and three brigades in Sumatra. The main objective of this aggresion was to seize rich plantation areas and the other areas which had natural resources, especially oil. As a cover for the international world, the Netherland called this military aggression as a police action and declared this action as domestic affairs. At that time the number of Dutch troops had reached more than 100,000 personnel with modern weapons, ammunition and also including heavy weapons granted by British soldiers and Australian soldiers. Later on, this situation made the UN Security Council through KTN (Three-State Commission) held an agreement at Jakarta Port on an American ship USS Renville by agreeing to a ceasefire along the demarcation line, otherwise known as the Van Mook line. Once again, the Netherland neglected the agreement by launching attack on December 19, 1948 using lightning war tactics (blitkrieg) in all areas of the Republic of Indonesia. 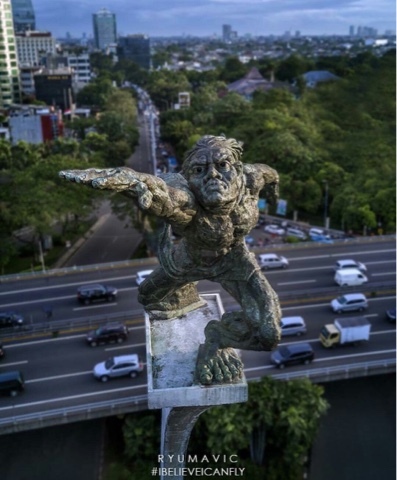 It began with the captured of Maguwo Airbase (currently known as Adi Sucipto Air Force Base) by deploying paratroopers and in a swift motion capable of taking control of the city of Yogyakarta which was the Capital of the Republic of Indonesia at that time. This attack also arrested the leaders of the Republic of Indonesia, Soekarno and Moh. Hatta. This condition made Soekarno to hand over the Republic of Indonesia to Syafrudin Prawiranegara, the Prime Minister of the Republic at that time, saved the National Flag and made an emergency goverment in Padang, West Sumatra. Approximately one month after the second Netherland Military Aggression which has launched in December 1948, the Indonesian National Army began to devise a strategy to counterattack the Dutch army which began by disconnecting the telephone, destroying the railway, attacking Dutch convoys, and some other acts of sabotage. This condition was made the Dutch were forced to multiply posts along the big roads that connected the cities that had been occupied. This means, that the strength of the Dutch forces was spread in small posts throughout the republic which is now a guerrilla field. In the circumstances of the scattered Dutch forces, the Indonesian National Army began an attack on the Netherlands. Around the beginning of February 1948 at the East Java border, Lt. Col. dr. Wiliater Hutagalung who was appointed as a Territorial Officer and was tasked with forming a guerrilla preparation network in the territories of Division II and III, met with Chief Commander Sudirman to report on UN Security Council resolutions and Dutch resistance to the resolution and launch propaganda stating that Republic Indonesia no longer exists. Through Radio Rimba Raya, Commander in Chief Sudirman also heard the news. Commander in Chief Sudirman instructed to think about steps that must be taken to distort Dutch propaganda about the condition of the Republic of Indonesia. The thinking developed by Hutagalung was, the need to convince the international community, especially the United States and Britain, that the Republic of Indonesia is still exist by the Republic of Indonesia Emergency Goverment (PDRI), there are armed forces organization and there are soldiers. To prove this and to penetrate isolation, a spectacular attack must be carried out which cannot hidden by the Dutch, and also must be know by UNCI (United Nation Commision for Indonesia) and foreign journalists who have been in Yogyakarta to be disseminated throughout the world. The city of Yogyakarta was surrounded by guerrilla forces from various directions. The course of the battle was fierce in several streets in the city of Yogyakarta. Resulting in panicked Dutch troops, due to lack of preparation in blocking attacks from the Republic. So that the resistance carried out by the Dutch was less significant for the Republic of Indonesia. Dutch troops can be pushed back in a short time, even the military post used was abandoned and Indonesian fighters managed to seize several military vehicles. The Indonesian National Army troops occupied the city of Yogyakarta for 6 hours. Exactly at 12:00 noon, as originally determined, the entire army was withdrawn. Unfortunately, the general attack on March 1, 1949 took many casualties, consisting of 53 Indonesian police and 300 soldiers killed. While the Dutch were 14 injured and 6 people were killed. The number of victims from the Netherlands based on Dutch media as many as two hundred people were killed and wounded, the number was calculated during the battle that took place in March 1949. Mr. Alexander Andries Maramis, based in New Delhi, described how excited they were to hear radio broadcasts captured from Burma, regarding the massive attacks by the Indonesian National Army on the Dutch. The news became Headlines in various print media published in India. The March 1 General Attack was able to strengthen the bargaining position of the Republic of Indonesia, humiliating the Dutch who had claimed that the Republic of Indonesia was already weak. Shortly after the General Attack on March 1, the Surakarta General Attack took place, which was one of the Republic of Indonesia's most brilliant successes because it proved to the Dutch that guerrillas were not only able to carry out ambushes or sabotage, but were also able to carry out frontal attacks in the middle of Solo cavelerie forces, heavy weapons artillery, strong infantry and commandos. Politic/Diplomacy. The plans of Netherland to attack Indonesia massively has been estimated in advance before the second aggression at December 19, 1948. That’s why the Indonesia’s temporary goverment center has been set up in Bukittinggi, Sumatra. Also, The center of foreign relations and diplomacy has been prepared in New Delhi, India. This general attack also raised the bargaining power of the Indonesian Goverment in the international forum. The Indonesian National Army have proved that they were still exist, have a good organization and capable to launch attack against the Netherland’s troops in order to prevent the independence. This attack also opened the world’s eyes and make them realized that Indonesia would fight until the end to get their independence. Indonesian National Army has been formatted on October 5, 1945, less than two months after the independence of the Republic of Indonesia. The organization has not established yet and some of the personnel who were supposed to occupy a position has not yet appeared. Even within a periode of three years, the Indonesia National Army’s organization that was still modest continued to make improvements while continuing to carry out wars in order to maintain independence. But this condition did not dampen the morale of the soldiers. Those with all available equipments always struggle to maintain the independence they have achieved. In addition, some leaders who were able to command also had received military training specifically for natives, they were incorporated in the PETA Battalion and other military units. This experience has more or less provided enough provisions for soldiers to fight against Netherland Army. People’s support. This factor can not be separated from the entire movement of the Indonesian independence war. The Indonesian people who have felt independence for more than three years will not be willing to give up their nationalism to become members of the Netherland commonwealth. This is what underlines the community to work hand in hand with other elements to join the struggle with Indonesian National Armed Forces, people who have weapons are struggling as much as they can, those who not have weapons can participate in providing logistics, both in the form of food and medicine. This they do sincerely and totally, solely to help the success of the struggle of the soldiers. “The Art of War”, as a book on ancient Chinese military theory has came out more than 2500 years ago, introduced by Sun Tzu who lived approximately from 550 BC to 480 BC. His book covers a rich content with brilliant ideas of military strategy which spread and influenced in world history. Chairman Mao also said that “weapons are important factor in war, but not decisive factor. It’s people, not things, that are decisive. The contest of strength is not only a contest of military and economic power, but also a contest of human power and morale. Military and economic power is necessary wielded by people”, which known as one of the famous Mao’s military thinking. One of the famous battle which was refers to this thinking is the general attack on the city of Yogyakarta that occured on March 1st, 1949 between the Indonesian National Army and the Netherland Forces which can raised the bargaining position of the Republic of Indonesia in the International Commitee. The Indonesian National Army which was consist of only 3000 personnel could launched a massive attack and occupied the city of Yogyakarta for six hours. This number of personnel was tottally different from the Netherland army which numbered more than 10,000 personnel. In addition, equipment,weapons and ammunition are very limited. This huge difference did not damped the intention of the soldier to fight. Proven by a very good spirit and strategy, supported by communication and coordination, also support from the people of Yogyakarta, the general attack was successfully carried out brilliantly. This certainly proves that victory or defeat in war is decided by people, not things. The event took place 72 years ago, precisely July 29, 1947, one year after the establishment of Indonesia Air Force. However, for the Air Force, the two events that occured at that time had great significance, which needed to be experienced and honoured by every Indonesian Air Force soldier. So, it is very appropriate if the day is then commemorated as the Indonesian Air Force Service Day. First, the Indonesian Air Force air strikes on the Dutch occupation areas in Ambarawa, Salatiga, and Semarang, carried out by Aviation Cadet Sutardjo Sigit, Suharmoko Harbani, and Mulyono, assisted by three technicians acting as air shooters namely Sutardjo, Kaput, and Dulrachman. The air raids carried out before dawn used two Chureng and a Guntei aircraft which are obtained from the spoils of Japanese Soldiers. Secondly, the death of three pioneers of the Indonesian Air Force, each Air Commodore Adisucipto, Young Air Commodore Prof. Dr. Abdulrachman Saleh, and Air Junior Officer Adisumarmo. When, the Dakota VT-CLA plane that was boarded and carrying medicines was assisted by the Malaya Red Cross, three Dutch Kitty-hawk planes shot and made it crashed in Ngoto Village, 3 km South of Yogyakarta. Both events began with the Linggarjati agreement which was an attempt to resolve the conflict between Indonesia and the Netherlands, but the Dutch denied it. Because, unilaterally sever diplomatic relations and take military action. Namely, by carrying out simultaneous attacks on the territory of the Republic of Indonesia on July 21, 1947 known as Dutch Aggression I. After the independence of the Republic of Indonesia which has proclaimed by Soekarno and Moh. Hatta on August 17th, 1945, the Netherland Goverment was still tried to took over the legal goverment of the Republic of Indonesia to became one of the commonwealth countries of the Netherland based on their own perception. According to this perception, the Netherland decided to directly attack the Republic of Indonesia in order to acces commodities in Republican-held areas, in particular sugar, oil and rubber as they had for more than 350 years before the independence of the Republic of Indonesia. The first military aggression was held in July 21, 1947 by deployed three divisions in Java and three brigades in Sumatra. The Netherlands launched a massive offensive into various parts of Indonesia, including at several air bases and the main target was the Yogyakarta Maguwo Air Base, because it was considered the center of the Republic of Indonesia's air power. However, due to bad weather, the attack failed and the Dutch transferred to other air bases such as Panasan Solo Air Base, Maospati Madiun, Malang Bugis, Pandanwangi Lumajang, Gorda Banten, Kalijati Subang, and Cibeureum Tasikmalaya. While outside Java, the Dutch attacked Gadut Air Base, Bukittinggi, West Sumatra. The main objective of this aggresion was to seize rich plantation areas and the other areas which had natural resources, especially oil. As a cover for the international world, the Netherland called this military aggression as a police action and declared this action as domestic affairs. At that time the number of Dutch troops had reached more than 100,000 personnel with modern weapons, ammunition and also including heavy weapons granted by British soldiers and Australian soldiers. The First Dutch Military Action provoked anger, apart from denying the agreed-upon Linggarjati Agreement, it also violated the legal provisions of war. For the Indonesian people, such arbitrary actions are seen as political pressure with the intention of destroying and understating the meaning of the Republic of Indonesia. As for the Air Force which was only just growing, the destruction of some of its airbases was a painful slap which was intended to break the fighting spirit of the Indonesian Air Force soldiers and narrow the space and limit the growth rate of the Indonesian Air Force. The flurry and indiscriminate Dutch attack provoked anger at the heart of the current Indonesian Air Force leadership. In their limitations and not recognizing surrender, they continued to try to draw up their strengths and strategies to hold a counter-air strikes on the territory occupied by the Dutch. On July 28, 1947 around 7:00 p.m., four pilot cadets namely Suharnoko Harbani, Sutardjo Sigit, Mulyono and Bambang Saptoadji were ordered to attend Air Force Chief, Commodore Suryadi Suryadarma and Young Air Commodore Halim Perdanakusuma. This very secret call concerns the air operations plan assigned to the four flight cadets to attack the Dutch position. The operation was not merely in the form of an order, but rather voluntary. However, none of the four cadets who were on average 19 years old retired from the task. All feel called and honored to carry it out. Early on July 29, 1947, Maguwo Air Base was still dark. However, it was suddenly thrilled by the roar of a plane carrying a mission that the Indonesian nation had never done. Aviation cadets Sutardjo Sigit and Suharnoko Harbani were ordered to attack Salatiga and Ambarawa, the Chureng aircraft flown were converted into bombers. The airplane cockpit was opened, the body and wings were given military green paint. The assault operation began at around 5:00 in the morning using one Guntei plane and two Cureng planes which took off sequentially from Maguwo Airfield. The Guntei aircraft was piloted by Air Cadet I Mulyono with water gunner Dulrahman who flew first to Semarang, carrying 400 kg of bombs. Followed by Cureng aircraft piloted by Air Cadet I Sutardjo Sigit with gunner Sutardjo water and Air Cadet I Suharnoko Harbani with Kaput air gunner. Two Cureng planes each carried a 50-kg bomb which was hung on each of its wings and water gunner held crates containing firebombs. When the bombs were released by throwing them directly at the target, in the form of buildings that became the headquarters of the Dutch army, at that time the sky was still dark and the city lights were still on. Meanwhile, Aviator Cadet Bambang Saptoadji, who used the plane to rush Hayabusha and was in charge of escorting aircraft manned by Aviation Cadet Mulyono, was forced to cancel because the aircraft had been prepared. After carrying out the bombing, they immediately returned to Maguwo Air Base by flying low. At approximately 6:00 a.m., one by one the aircraft began landing back to the base and the plane was immediately hidden under a tree. That morning, the atmosphere at Maguwo Air Base was overwhelmed with pride, pleasure and emotion because the air fighters had successfully carried out the task and returned safely. Why not, because the operation that had just been carried out was the air force's first air operation since its founding in 1946, an extraordinary air operation, because it was carried out using a new Japanese heritage aircraft that had been repaired by Air Force technicians themselves. The attack on the Dutch position in Semarang, Salatiga and Ambarawa carried out by cadets of this pilot school was indeed not a major attack. The attack was carried out by three wreckage planes from Japanese soldiers. But what was done by the three planes was very meaningful for the struggle of the Indonesian people, especially for the Indonesian Air Force which at that time was only one year old. The attack carried out in the morning was a major decision carried out at a strategic level where the Air Force's own leadership, Air Commodore Suryadarma ordered an attack on Dutch occupation in the three cities. The success of the attack is an effort accompanied by prayer and supported by the universe. How not, in the limitation of the Indonesian Air Force which is only a year old, aircraft that are still under construction and pilot schools whose conditions are so limited they are able to carry out an attack mission that is carried out carefully and produce a tremendous shock effect for the Dutch. Enhancing the Indonesian Armed Force’s Patriotism. The soul of nationalism and patriotism that exist within the cadet of flight schools and aircraft engineers is very large. they realized that the Dutch would do anything to re-colonize the Republic of Indonesia. this became one of the drivers of their determination to feel called to carry out a noble task, attacking the Dutch position in all three places even though with equipment and equipment far from adequate, they managed to repair and fly a junk plane as one of the spoils from the Japanese army powerful attacking machine. This strikes of course fueled the fighting spirit of the other soldiers. Not only for the Air Force, it also greatly helped improve the army's fighting mentality to continue to fight against the Dutch position in various regions. Increasing Bargaining Power of Indonesia’s Position in International Forums. Indonesian Armed Forces has been formatted on October 5, 1945, less than two months after the independence of the Republic of Indonesia. The organization has not established yet and some of the personnel who were supposed to occupy a position has not yet appeared. Even within a periode of one year, the Indonesia Armed Forces’s organization that was still modest continued to make improvements while continuing to carry out wars in order to maintain independence. But this condition did not dampen the morale of the soldiers. Those with all available equipments always struggle to maintain the independence they have achieved. In addition, some aviation cadet and technician who were able to prepared the mission also had received military training specifically for natives. This experience has more or less provided enough provisions for soldiers to fight against Netherland Army. And also the air strikes that they did has made the other countries, especially in the United Nation International Forum saw how struggle the Indonesian Armed Forces is in fighting the Dutch. This condition made them forced the Dutch to stop the invasion and made another agreement on the USS Renville which was docked at Jakarta Port. The Realizing Of Developing Indonesian Air Force. The attack on the three cities in addition to increasing the mental fighting of Indonesian Armed Force’s soldiers and increasing the bargaining power of Indonesian politics in the International Forums, also made Indonesian leaders at that time to realize how important the meaning of air power is. This makes Ir. Soekarno, the president of the Republic of Indonesia at that time, then gradually built up air power until finally in the 1960s Indonesian air power became one of the largest and strongest in Southeast Asia and the South with many soviet-made planes. The success of the first air strikes into the Dutch position over three cities was made the international forum realize that Indonesian people has struggles in preventing their independence. The success of these air strikes in addition to providing advantages to the Air Forces also gives disadvantages. The bombing of the Dutch position in the three cities certainly caused tremendous anger from the Dutch army. They immediately launched air patrols around Solo, Yogyakarta and Semarang and brutally attacked areas suspected of being Indonesia Armed Force’s hideouts. The peak occurred in the afternoon where a Dakota plane with the registration number, VT-CLA carrying medicines donated by the Malaya Red Cross to the Indonesian Red Cross, and clearly has not been armed was shot down by two P-40 Kitty Hawk hunter aircraft of the Dutch. At that time, the Dakota VT-CLA aircraft was piloted by Alexander Noel Contanstine in preparation for landing at Maguwo Air Base. Suddenly two Dutch hunters appeared. Without giving a warning, the Kitty Hawk aircraft attacked Dakota aircraft with machine guns and hit the engine on the left side of the plane. As a result the Dakota VT-CLA crashed on the embankment of the Ngoto Village rice field, Bantul, south of Yogyakarta. The independence of the Republic of Indonesia which was proclaimed on August 17, 1945 as a result of the struggle of Japanese occupation did not necessarily go smoothly. Dutch who previously colonized Indonesia still wanted to master their natural wealth. This is what prompted the Dutch royal army to piggyback on allies under the guise of NICA to regain control of Indonesia. At its peak, they carried out the first military aggression on July 21, 1947 and seized control of territory previously occupied by the Indonesian Armed Forces, including several air bases except Maguwo Air Base which had previously been covered in thick fog. In addition to generating advantages for the Indonesian Air Force, this incident also caused disadvantage to the Indonesian Ai r Force, where this attack caused anger on the Dutch side. At its peak, in the afternoon after the attack, a Dakota airplane with registration number VT-CLA, carrying medical support from Malaya Red Cross was brutally attacked and shot down and finally killed the founders of the Indonesian Air Force. The Indonesian nation was overcome with a deep atmosphere of grief because the incident caused the death of three Air Force pioneers, namely Air Commodore Agustinus Adisutjipto, Young Air Commodore Prof. Dr. Abdulrachman Saleh, and Young Air Officer Adi Sumarmo Wirjokusumo. This first air strike was a very appropriate decision making at a strategic and tactical level and brought pride and heroism to the Indonesian Air Force. However, the struggle carried out also requires a great sacrifice with the death of three pioneers of the founding of the Indonesian Air Force. Later on, to commemorate and perpetuate this historic event, since July 29, 1955 is celebrated as "A Day of Mourning" Air Force. Then, starting July 29, 1962 was changed to "Indonesian Air Force Service Day" and was celebrated centrally at the Adisutjipto Air Base (Maguwo). Where the Dakota plane crashed, a monument was named the Ngoto Monument, since July 17, 2000, the Ngoto Monument has become the Monument to the Struggle of the Air Force. Illegal logging is the activity of logging, transporting and selling timber which does not have permission from local authorities and is a form of factual threat around illegal borders. Although illegal logging rates are certainly difficult to obtain due to illegal activities, some reliable sources indicate that more than half of all illegal logging activities in the world occur in the Amazon watershed, Central Africa, Southeast Asia, Russia and some countries of Balkan. ”A collaborative study between the United Kingdom and Indonesia in 1998 indicated that around 40% of all logging activities were illegal, with a value of US $ 365 million”. “A more recent study comparing legal logging with domestic consumption coupled with exports indicates that 88% of all logging activities are illegal logging”. According to Ministry of Forestry data in 2006, the area of forest damaged and unable to function optimally has reached 59.6 million hectares of 120.35 million hectares of forest area in Indonesia, with deforestation in the last five years reaching 2.83 million hectares per year. If this condition is maintained, where Sumatra and Kalimantan have lost their forests, then forests in Sulawesi and Papua will experience the same thing. According to the analysis of the World Bank, forests in Sulawesi are expected to disappear in 2020. The condition of illegal logging if left uninterrupted without serious handling, it is not impossible that in the next few years our earth will not have forests anymore. This will certainly be a burden for the next generation. In principle, the earth is not inherited from our predecessors, but loans from our next generation. As an air force personnel, our tasks is not only to maintain air territorial sovereignty and create air supremacy, but also to maintain territorial security, both from the threat of other countries and from domestic threats, such as terrorism, rebellion and smuggling. One of the illegal activities that is the concern of the government and the air force today is illegal logging. The government is working hard and empowering all existing components to fight these illegal activities, including empowering air force defense equipment, where one of the tasks of the air force is to assist the government in handling illegal activities including illegal logging. The limited endurance of the aircraft carrying out the reconnaissance mission. Lots number of crew involved. High demand for aircraft maintenance. At present, with the development of aviation technology, especially unmanned aircraft technology, the limitations mentioned above can at least be overcome. Unmanned aircraft technology has indeed been developing since the 1970s where the aircraft were used for reconnaissance activities into enemy areas. Now, where war is no longer sweeping many countries, the use of drones for military operations other than war continues to develop. However, the development of unmanned aircraft technology continues to progress, both in form, specifications and weapon capabilities. The use of unmanned aircraft for security purposes is also increasing. Some institutions other than the air force such as the navy, police and border guards also use this technology to support the implementation of their duties. Thus, the use of unmanned aircraft technology can also be applied to the task of the air force in supporting the government against illegal logging. Long Endurance Flight Compared to Conventional Aircraft. Observations, surveillance and reconnaissance flight mission using conventional aircraft have endurance limitations. For example, Boeing 737-400 aircraft used for surveillance missions with full tanks can carry out their duties for up to 5 hours. But in its implementation, the crew will not fly the aircraft during that time without changing shifts. With the existing UAV technology, endurance Medium Altittude Long Endurance (MALE) UAV in one flight mission can reach more than 20 hours, crew members who carrying out flight missions can also carry out shift changes with the aircraft still in the air while carrying out surveillance. This is of course in addition to saving, it can also streamline crew change times and carry out surveillance and reconnaissance missions. Easy in Maintenance. The use of UAV as a support vehicle in against illegal logging, in addition to having a long endurance advantage is also very easy to maintain. In the era of digitization and computerization, problems of problems that exist in the UAV system can be known quickly and accurately, so that the implementation of maintenance can be done easily and quickly. Besides that, the system in UAV aircraft is also fairly simple and not as complex as conventional manned aircraft. Maintenance crews who work also are not too many, so that it can indirectly reduce personnel needs in maintenance and optimize the use of human power for other tasks. Low Operational Cost. Lets see, a Boeing 737-400 which is used for surveillance with full tank can only fly for around 6 hours, the fuel consumption is 3000 liters/hrs. In a simple calculation, this aircraft has cost 18.000 litres of fuel for one flight, and if we calculate it by US$ 1/litre it will cost around US$ 18.000 for one flight. Then we can compare with the one of the UAV that have tank capacity 150 litres, if the fuel consumption is 10 litres/hrs, then this UAV could fly for around 15 hours and just cost not more than US$ 150. From this simple calculation, we can assumpt that the operational cost will be very low than we use the conventional aircraft for the surveillance mission. Realtime Imagery. One of the advantages of using UAV is “realtime imagery”. This feature can be supported by the payload which is installed on the UAV. The pilot can also see every objects that UAV see in realtime by the uplink and downlink communication between the UAV and Ground Control Station (GCS) during flight time. In addition, images obtained from uav and seen in the GCS can also be forwarded to various agencies and authorities involved in the operation mission, so that decision making can be done as soon as possible and the deployment of troops to arrest perpetrators can also be guided by the UAV at the same . The use of UAV in fighting illegal logging is indeed very beneficial in many ways. This will certainly be a serious consideration for the air force to use this unmanned technology. However, in some cases UAV usage still has limitations to optimize its role. Among the limitations is that UAV has limited Radius of Action (ROA). As a remote system, UAV always controlled by the Ground Control Station (GCS) all the flight. There are two type of UAV from the control system; Line Of Sight (LOS) which is the UAV should always seen by the GCS’s antenna in order to keep the two way communication between UAV and GCS, and Beyond Line Of Sight (BLOS) where the communication betwen UAV and GCS are controlled by satellite. For many countries who don’t have satellite facility, the used of UAV can only made by LOS system. Means that the maximum distance between UAV and GCS is not more than 300 km. This distance is based on the contour of the earth, the cruising altittude of UAV (25.000 feet), and the strength of the frequency. However, by the development of technology of UAV, I believe that this limitation will always been upgraded in order to shift the manned aircraft to be unmanned aircraft technology in some use. The proliferation of illegal logging in recent years has severely disrupted environmental stability in various countries such as America, Brazil, several Asian countries including Malaysia and Indonesia and countries in Africa. In addition, this activity also harms state revenues because these illegal activities do not comply with applicable regulations regarding the trade in timber that has been regulated by each country. Various ways have been done against illegal logging, one of which is to deploy existing defense components such as the Air Force with the ability to observe and surveillance using aircraft. Along with the development of the latest aircraft technology, especially unmanned aircraft, the use of aircraft for surveillance of illegal activities began to shift from conventional aircraft to unmanned aircraft. This happens because of several things that are the advantages of using UAV, including long endurance, easy maintenance, low operating costs, and real time imagery that can be seen directly during flight and can even be forwarded to the ranks of authorized parties and agencies who are competent in fighting illegal logging activities. Aside from some of the advantages already mentioned, the use of UAV also has disadvantages, especially for countries that do not have satellite technology and have used UAV, namely radius of action limitations. This is due to the contour of the earth and the limited roaming height of the uav which is operationalized. Almost all uavs without satellite communication can only reach 300km. This is certainly a separate limitation for countries that use uav without satellite technology. However, the use of UAV will continue to increase along with technological developments, and in some countries this has proven to be quite effective in fighting illegal logging which if not immediately anticipated will result in the depletion of forests on this earth. Greenpeace (2003) Partners in Crime: A Greenpeace investigation of the links between the UK and Indonesia’s timber barons. Woooow, hari ini tepat setahun saya tidak menulis blog hahahahaha. Tahun 2018 telah berlalu, dan hari ini, 1 Januari 2019 saya memulai lembaran baru..., di negeri orang. Yup, People Republic of China, atau kita kenal dengan RRC maupun RRT. Suatu negara yg berpaham sosialis komunis, paham yg saat ini sedang banyak dimusuhi oleh berbagai kalangan di negara saya, Indonesia. Dikit-dikit komunis, apa-apa komunis. Bahkan ada saja akun anonim yg bilang keberangkatan saya belajar merupakan salah satu bentuk afiliasi pemerintahan sekarang dengan negara China. Heloooowwwww, WTF you guys!!! FYI, saya adalah perwira siswa angkatan ke-20, ARTINYA, kerjasama dalam bidang pendidikan militer ini sudah berlangsung sejak 20 tahun yang lalu. Nah, tinggal dirunut saja itu sejak pemerintahan siapa. Kita tidak bisa memilih mau sekolah dimana, ditugaskan dimana, atau menjadi anak buah siapa. Namanya tentara ya hanya satu kata ---> "SIAP, laksanakan". Banyak hal yang sudah menjadi pencapaian saya di tahun 2018, pun tak sedikit yang menjadi harapan (bahasa kerennya resolusi) di tahun 2019 ini. Yang jelas, tak sedikit yang saya syukuri sebagai nikmat dan amanah dari Allah SWT. Dan sebagai duta bangsa, wakil dari TNI, sudah menjadi kewajiban saya untuk tetap berpegang teguh pada Sumpah Prajurit, Sapta Marga dan 8 Wajib TNI yang kesemuanya merupakan pengejawantahan nilai-nilai luhur Pancasila. Informasi merupakan kebutuhan pokok setiap orang. Informasi berguna bagi pengembangan pribadi dan lingkungan sosial serta merupakan bagian penting bagi ketahanan nasional. Media massa sebagai sumber informasi, sarana pendidikan dan hiburan memberi pengaruh yang sangat penting dalam menggiring opini masyarakat yang kemudian akan berdampak luas terhadap stabilitas nasional. Namun demikian saat ini perkembangan teknologi ditambah dengan semakin gencarnya tuntutan demokrasi, khususnya dalam hal kebebasan berpendapat, membuat mobilisasi opini publik terhadap suatu hal yang berkembang di masyarakat menjadi sangat cepat, bersifat online dan real time. Kondisi ini sangat positif untuk penyebaran informasi-informasi positif dan penting kepada publik bahkan dalam lingkup dunia, karena informasi sudah tidak lagi terkendala waktu, jarak maupun ruang dengan teknologi. Bagai dua mata pisau teknologi juga membuat media informasi (massa) menjadi alat propaganda yang sangat cepat dan tak bebatas waktu dan ruang dalam menyebarkan berita negatif yang bahkan mampu menggoyang stabilitas suatu negara. Ancaman keamanan saat ini tidak hanya dari sisi kekuatan militer. Kasus-kasus terorisme misalnya mampu digerakan sekelompok kecil orang secara lintas negara dan mampu berdampak pada stabilitas seluruh dunia. Bentuk ancaman lainnya adalah kriminalitas dunia maya dengan menyebarkan berita hoax dan menggiring pola pikir warga negara yang kemudian menimbulkan ketidakstabilan politik, kerugian secara ekonomis, atau bahkan menimbulkan kegaduhan bila bertentangan dengan kondisi sosial budaya dan agama. Dalam kasus lain, kebocoran data baik secara sengaja maupun akibat pembobolan sistem informasi dapat digunakan untuk menyerang suatu negara dari segi pertahanan dan keamanan. Perkembangan dunia maya (cyber) telah menciptakan suatu situasi yang tidak hanya mempermudah komunikasi lintas batas negara, tetapi menciptakan medan pertempuran baru, dengan serangan-serangan informasi menggunakan kanal-kanal media online maupun media sosial yang ada. Ancaman terhadap suatu negara tidak lagi hanya berupa ancaman serangan fisik, melainkan juga melalui ancaman cyber yang dapat menyerang infrastruktur strategis dan obyek vital nasional. Oleh karena itu menjaga keamanan dalam perang cyber merupakan suatu hal yang positif. Institusi TNI sebagai salah satu lembaga pemerintah yang bergerak dalam bidang pertahanan negara, tentunya akan mendukung program-program yang dijalankan oleh pemerintah secara total. Namun berkaca kepada “status” lembaga negara yang satu ini sebagai lembaga negara yang netral dan tidak boleh terlibat dalam politik praktis, institusi TNI pastinya memiliki metode-metode tersendiri dalam menjalankan kebijakan pemerintah tanpa menyalahi kodratnya sebagai lembaga negara yang tidak memiliki sikap keberpihakan kepada kubu atau partai politik manapun. Media sosial, baik cetak maupun elektronik, dan yang saat ini sedang berkembang dengan sangat pesat seperti twitter, instagram, facebook dan lain sebagainya sangat memiliki nilai strategis terhadap pertahanan negara, baik kubu pemerintah maupun oposisi saat ini gencar menyampaikan opini-opini dan program-program serta kritik, saran dan masukan yang tentu saja menggiring opini masyarakat untuk mengikuti dan mendukung apa yang dicanangkan oleh kedua belah pihak. Pemerintah dengan program-programnya yang tentu saja disesuaikan dengan program pembangunan berkelanjutan yang terkenal dengan “Nawacita”-nya, sedangkan pihak-pihak “oposisi” juga terus mengkritik pelaksanaan program pemerintah yang dirasa tidak merata dan hanya menguntungkan pihak-pihak maupun lapisan masyarakat tertentu. Hal ini dirasakan semakin masif karena ditunjang dengan adanya kebebasan berpendapat yang disalahartikan dan cenderung kebablasan. Tentara Nasional Indonesia sebagai lembaga negara yang memiliki tugas menjaga kedaulatan dan pertahanan negara kerap kali mendapat fitnah dan selalu dipojokkan dengan opini-opini yang mendeskreditkan institusi hanya karena mendukung dan menyebarluaskan serta membantu sosialisasi program-program pemerintah. Hal ini tentu saja akan menjadi perang opini dimana sebagian masyarakat sudah mengerti dan memahami tugas pokok TNI, namun di sisi lain ada sebagian masyarakat yang belum tahu, apalagi parahnya malah menutup diri dan tidak mau tahu tentang hal ini akibat indoktrinasi paham-paham radikal yang sengaja disebarkan oleh beberapa golongan yang tidak puas dengan pemerintahan yang sah saat ini. Kebebasan berpendapat yang cenderung “kebablasan” ini tumbuh subur karena kecenderungan masyarakat saat ini yang kurang peduli dan tidak mau menelaah lebih dalam atas suatu hal atau berita yang berkembang, ditambah lagi dengan beberapa media yang “disetting” untuk menyuarakan kritik terhadap pemerintah dengan judul yang demikian bombastis, tentunya akan memancing masyarakat untuk meneruskan atau istilah kerennya “memforward” berita tersebut tanpa membaca isinya terlebih dahulu. Hal ini tentunya akan menimbulkan kerugian dan mengurangi tingkat kepercayaan masyarakat terhadap pemerintah, parahnya lagi dapat menimbulkan gejolak di masyarakat yang jika tidak segera diantisipasi dan ditindaklanjuti akan menimbulkan gerakan-gerakan anti pemerintah yang tentunya mengancam stabilitas pertahanan negara. Hal ini sudah menjadi perhatian para pimpinan di lembaga keamanan dan pertahanan negara baik TNI maupun Kepolisian dengan dibentuknya satuan khusus yang menangani media sosial terutama aplikasi-aplikasi yang ditenggarai berpotensi besar dalam menyabarkan berita-berita fitnah (hoax) dan indoktrinasi paham-paham radikal yang berkembang di masyarakat yang disebarkan melalui basis agama dan paham lainnya. Tim ini bertugas menyuarakan dan mensosialisasikan kebijakan-kebijakan pemerintah bekerjasama dengan kementrian dan lembaga negara lainnya tanpa menampikkan statusnya sebagai institusi negara yang netral dan tidak ikut berpolitik praktis, karena pada dasarnya TNI-Polri merupakan lembaga negara yang mengikuti kebijakan pemerintah berdasarkan politik negara. Di samping itu penggunaan media sosial di kalangan TNI-Polri juga bertujuan untuk mengenalkan institusi TNI-Polri dalam rangka penggalangan serta pengenalan kepada masyarakat tentang institusi yang mungkin bagi sebagian masyarakat terutama yang di pelosok merupakan institusi atau lembaga yang eksklusif dan sulit digapai oleh cita-cita generasi muda mereka. Hal inilah yang perlu diluruskan sehingga diharapkan ke depan, masyarakat lebih mengenal institusi TNI-Polri dan memiliki gambaran tentang bagaimana institusi tersebut mendukung segala kebijakan pemerintah serta mengubah deskripsi tentang institusi yang sangar, tegas dan jauh dari masyarakat menjadi institusi negara yang dekat dengan masyarakat, ramah tanpa meninggalkan ketegasannya serta humanis dan merakyat. Disisi lain dalam konteks regulasi, keterlibatan TNI dan Polri dalam bermedia sosial tetap harus mematuhi rambu-rambu keterbukaan informasi publik yang diatur oleh Undang-Undang Nomer 14 Tahun 2008. Dalam undang-undang tersebut terdapat pengecualian informasi yang dapat diakses publik, yaitu jika menyangkut informasi pertahanan tidak diperkenankan dibuka untuk publik. Media adalah mediator terbaik antara pemerintah dan masyarakatnya. Media berfungsi sebagai jembatan yang menghubungkan berbagai pemangku kepentingan dalam sebuah negara. Karena itu peran media massa termasuk media online menjadi sangat penting. Pemerintah tentunya mengharapkan dukungan dari media sebagai penyambung lidah dan penyampai kebijakan-kebijakan yang dilakukan oleh pemerintah agar dapat menjangkau seluruh lapisan masyarakat baik di perkotaan. Masyarakat tentunya ingin tahu apa saja program dan kebijakan pemerintah yang telah, sedang dan akan dilaksanakan. Demikian pula, pemerintah menginginkan masyarakat mengetahui berbagai program yang dilakukan oleh pemerintah sehingga dengan adanya media ini, masyarakat dapat mendukung dan ikut memberikan kontribusi kepada program-program yang dijalankan oleh pemerintah. Mayor Pnb Kamto Adi Saputra, ST.